Australian Park BBQs are certainly an iconic Aussie way of life due to our easy climate and outdoor culture. Over the decades the BBQ has become a vital part of any household, from everyday meals to entertaining friends. Yet not only has the BBQ become an essential part of the Australian home. It is also part of our unique Australian culture to enjoy a park BBQ when visiting our local community parks. Hence, almost all of our local communities provide public BBQs at any outdoor location that people are likely to gather. Originally public use Australian park BBQs consisted of a rough construction of a steel plate supported by a few stones. All one needed was to collect some local wood pieces and you were away. However, with safety in mind came to invention of the next great Australian BBQ. Who could forget the 44-gallon drum cut in half long ways with a plate of steel on top. This type of park BBQ was the most common for many years around the whole country. Cheap and easy to construct they certainly served the country well for a long time. Over the past decade, as public safety and environmental responsibility has become more of a focus, there has been a shift towards a new generation of park BBQs. The ready supply of sticks and wood available at our parks has diminished and concerns of bushfires has grown. A heightened sense of responsibility for community safety in public spaces has resulted in a strong swing towards more sophisticated BBQs. This demand has seen the introduction of some very safe, clean and certainly more hygienic public BBQs. Nowadays modern Australian park BBQs are made using commercial grade 304 stainless steel with electric hotplates or alternatively hotplates that run on gas. These BBQ’s have built in safety features that make them much safer to leave in unattended public spaces. They are specifically designed to be used by people with minimal knowledge about the operation of them. Importantly they are also now far more hygienic. As a result, park BBQs are now installed by all local councils and by anyone with a public/semi-public BBQ area. We see all sorts of situations where it is essential to have a BBQ designed for public use. Sporting venues, residential apartment buildings, caravan parks and tourist resorts, communal areas in workplaces, schools, and various clubs and associations are just to name a few. There seems to be no end of places one needs to install a park BBQ for public use. 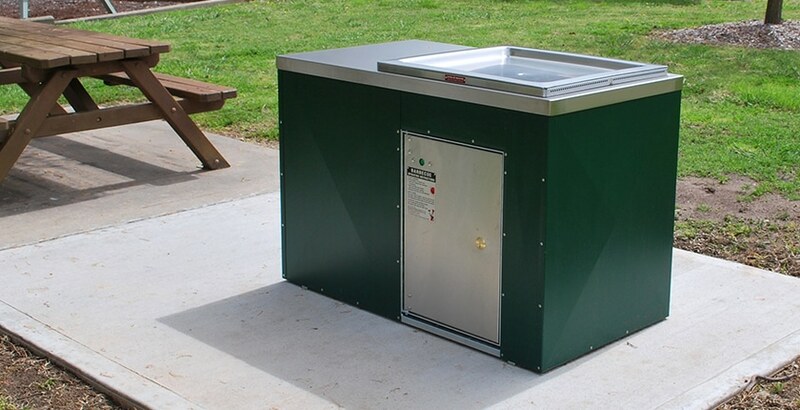 Modern park BBQ’s built to high commercial standards and will resist the Australian elements well providing good service in all conditions for many years. At PARKQUIP we have a full range of commercial style outdoor park BBQs to choose from to suit your individual needs. It seems that although a uniquely Australian phenomenon the idea behind our Aussie park BBQ is spreading across the globe. People in locations in around the world are now looking for this type of BBQ and this way of life. It is an enjoyable part of our culture to share and one in which we should all be very proud. Our extensive range of commercial park barbecues are proudly Australian made and built tough to last in our Australian outdoor conditions. Why not take a look and contact us about your project today!